The MX.45xx (incl. MX4530 Converter Board )for the first time offers full 16 bit resolution synchronously on two channels at very high sampling rates. Every channel has its own amplifier and A/ D converter. 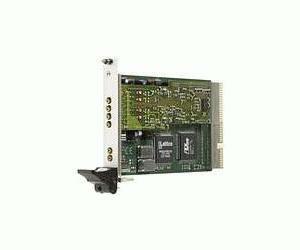 This eliminates the problems known from multiplexed systems like phase error between the channels or high crosstalk. Every input channel could be offset calibrated using the software. The user will find easily a matching solution from the three offered models. These versions are working with sampling rates of 200 kS/s, 500 kS/s or 1 MS/s. The boards could also be updated to a multi-channel system using the internal synchronization bus.